After a slow recovery from the holidays, we are finally settling into a welcome routine. The holidays were full of inspiration and I am looking forward to getting started on new projects. The first sewing project of the year was a a birthday card for my amazing mother-in-law. 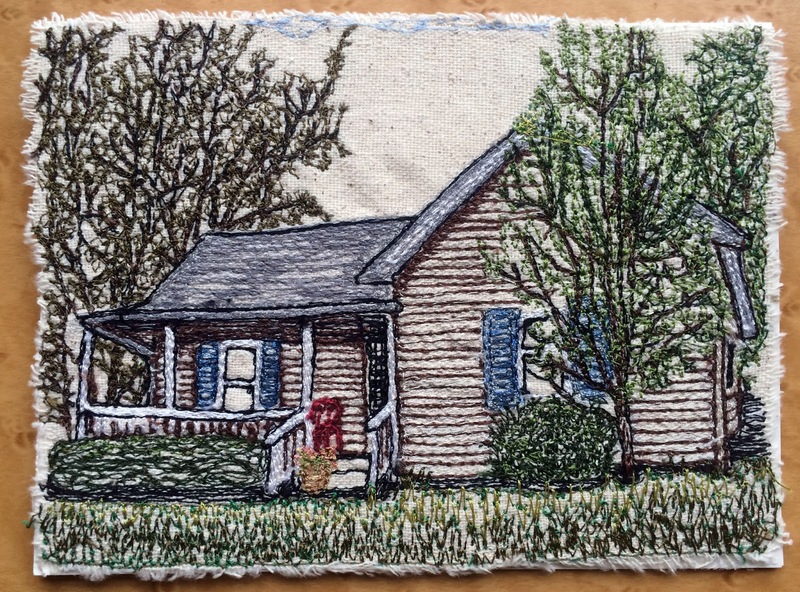 I used a photo of the house her mother and father lived in many years ago. 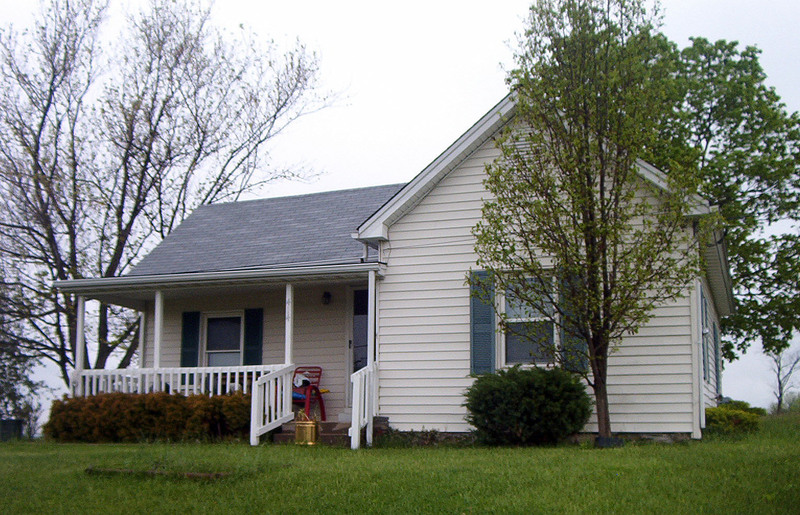 My husband has fond memories of visiting his grandparents in this house. 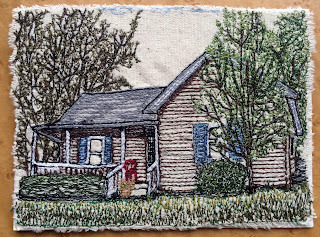 The stitched version makes the house look more rustic than it really is. I have added leaves to the background trees. Rather than bind the edge of the thread sketch, I chose to tear the fabric away and leave it frayed. I like this look, but it takes a little planning and preparation to ensure that the fabric will tear properly once the stitching is completed. To do that, I measured the card size. Keep in mind that the stitching will draw the fabric a little. Once my measurement was made, I pulled threads from the base fabric along the measure lines to ensure the grain would be square with my picture. Pulling the threads also marked where the stitching would stop. My sister sent an adorable Santa carved into a wooden thread spool. 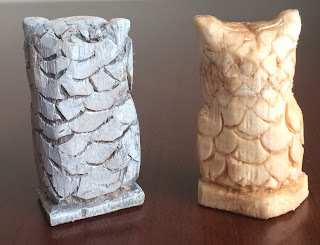 Her work inspired me to give hand carving a try, but I did not know where to start. Serendipity took over during the holidays and I was introduced to an artist who has a series of wood carving videos posted on YouTube. You can find her by searching for SharonMyArt. I made a small investment in supplies, including a beginner palm and knife set, a pair of gloves and a bag of pre-cut basswood blocks. A few days later, here are my #1 and #2 wood carvings! Pretty rough, but having fun! 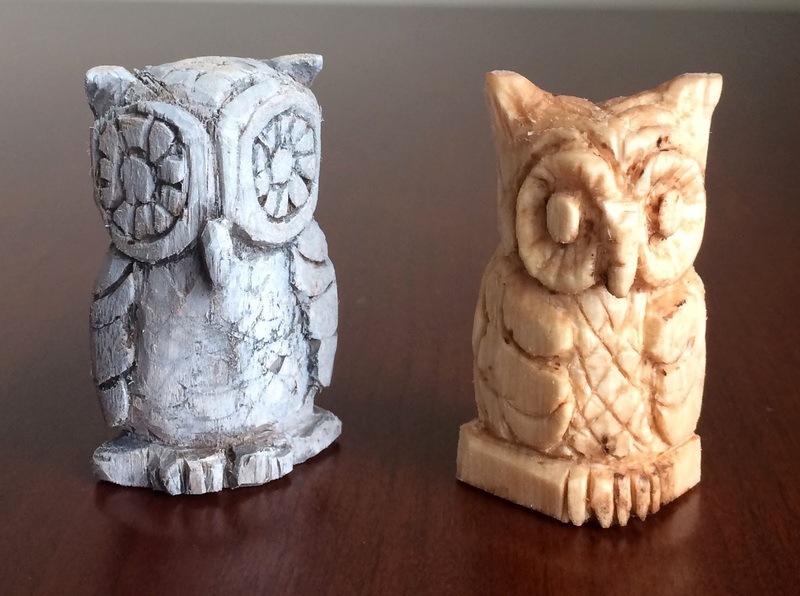 Though the cuts on #2 (right) are a little more controlled than on the first owl, more practice is needed to eliminate the "fuzz" caused by multiple cuts. #1 (left) was painted and finished with linseed oil. #2 was dipped into linseed oil tinted with a bit of paint. 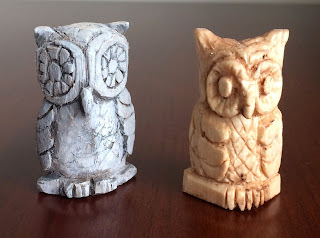 I am anxious to see what I can do with the hand carving tools. I hope you will check back in a few weeks to see what develops! This is so cool!!! Sharon sent us a little kit with knives and we are getting started slowly too! We need to speed up the process as we are heading out to visit her in two weeks - would love to have something to show her!! Thank you! Have a fun trip! I can't wait to see your work!